(CNN) – Republican lawmakers who suggest there are grounds to impeach President Barack Obama are focusing their energy in the wrong direction, Gov. Bobby Jindal of Louisiana said on Sunday. Jindal, a Republican, said GOP lawmakers should focus instead on getting rid of Obama’s signature health care law and promoting greater school choice for parents. “The reality is I didn’t like it when the left spent eight years trying to delegitimize President Bush, calling to question his election. I don't think we should be doing that to President Obama," continued Jindal, the chairman of the Republican Governors Association. At least three congressional Republicans have floated impeachment this month while speaking with constituents at town halls. On Thursday, video surfaced of Sen. Tom Coburn responding to a question from a constituent by asserting the president's policies were approaching a legal standard for impeachment. Without using specifics, the Oklahoma Republican pointed to what he called "intended violation of the law" by Obama's administration, as well as general incompetence of some of his appointees. Republican Rep. Blake Farenthold told his Texas constituents earlier in August that the House of Representatives "could probably get the votes" to impeach Obama. 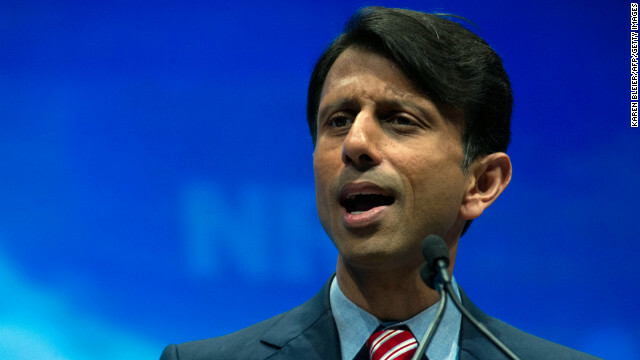 That sort of talk, Jindal said, wasn’t going to help Republicans push through new policies. That is what we want to get done!! We are tired of a liar, who has made things way worse than ever. He has no idea of what needs to be done. Obama has taken this whole country on a roller coaster ride with our lives in the seats. Nothing has happened since he was instated 5 years ago. I don't care how people feel about him enough is enough!! That's because Bobby is catching the clue that the tea folks are loonies and that calling for impeachment – when even the GOP's own leaders admit there is absolutely NO EVIDENCE OF WRONGDOING – is just another nail in the GOP's coffin. Hate to break it to you, Bobby, but we caught on a loooooong time ago that your party has been taken over by a bunch of lunatics. And we will show you all just how much we know come November 2014 when we send ALL the rethugs packing. @nintex: "I taught elementary school for too many years not to recognize the typical fourth-grade playground tactic of whatever you're doing that got you into trouble, point at the other guy and yell and scream as loud as you can that he started it and it's all his fault." I think this impeachment talk is rabble rousing to an audience that wants to hear . Its also from two only Republican house members who don't actually see the grounds to do it as you report = impeachment. Me, fed up of this go for it Republicans place you impeachment ideas and make it fact!! Ooooops how many seats do you wanna lose in the 2014 house elections And senate!?? All of you are idiots!! !For you people that have no clue.... here's some stats on this CRUMMY President..... President Obama doesn't seem to believe in the capitalistic system and has instituted major regulations which have stunted economic growth. The social justice economic plan is failing and American's are suffering. Economy and wages are stagnant and the quality of life is down and continues to be so. Here are some facts to back that up. * 7 out of 8 jobs created are 'Part Time' * 54% of American's make 'Less Than' $54,000 a year * Avg duration of Unemployment: 20 weeks in 2009 / 37 weeks now * More than 8 Million Americans stopped looking for work. * Trade deficit with CHina was $268 Billion, $315 Billion in 2012 * Poverty rate stands at 16%. That is the 'Highest' since 1965 when started. * Food Stamps, Under Obama, have increased by 11 Thousand 'PER DAY' under his watch . * Gas: 2009 = $1.85 per gal Now: $3.53 per gal. * Avg. Worker Health Insurance costs have 'Increased' by 29% and going higher due this horrible ObamaCare. So while some of you run around not know 'Jack' and think this guy is 'Likable'.... he has no clue on what or how to fix this economy. Any of you who say, "Oh, well look what Bush did that's why!" Well, you have NO CLUE. This President has increased the debt of this country MORE than ALL Presidents COMBINED! Get a clue people.... this guy and his socialistic beliefs are Killing this country. And we've got 3.5 more years of it. WoW! Looks like Bobby Jindal fell out of lockstep. The Guns Over People Partial Government Shutdown Tea potty will call him a RINO. Go ahead, Jindal and push for another record breaking deal for count number "41" for "No Repeal" for the "Affordable Care Act". Keep wasting everyone's time, including your own. Your not even looking at all of the good that this signature healthcare law has been doing. Look at all of the children who have pre-existing conditions that have been getting the care they need now for months because of this new law. If the care is taken away from these children it will greatly effect them and the families who love them, let alone who's to say if would be a life or death situation for any them without the current care they are receiving. The people in our country need healthcare. You all have no other plan, so move on with the repeal because it's never going to happen. There's no plan out their that's going to make it happen because you all don't have one! Try having to watch a family member struggle losing a loved one because the insurance stopped paying on them because it was capped out! I think it's time for everyone in our government to just move on from this subject and start doing something that is beneficial to our country. The health of everyone in our country is beneficial and everyone who's trying to continually stop something that is good, I have a serious problem with that because your not doing anything to come up with anything better. Add on: This is one that thing the entire country needs to get a grip on and understand. Regardless if this Affordable Care Act (Obamacare ) did pass, did not pass, is funded or defunded, it's everyone's responsibility to take care of his or her own health! There are companies that do not offer healthcare, the costs are to high so we have those can't afford healthcare, people with pre-existing conditions that cannot get coverage, the insurances cap out after certain dollar amounts and then stop paying for on peoples health ect........... ...... There are good reasons why the "Affordable Care Act" passed. Republicans . . . What a wast of government! America, majestic in all Her beauty and greatness chooses the sad act and practice of "Cutting" To deface and cover herself with scar like tattoos of hypocrisy and bigotry. Do you think it's because they can't take being "Eye Balled" from a black man, who just happens to be The President of These United States of America, The greatest country that never was? Go figure, from birthers to impeachers. hey GOP grab it between your thumb, no never mind, you would not get it anyway. GOP The "Great Obstructionist Party", the party the lead to the destruction of America.